27,000 people work in Baden and the city is home to 19,000 permanent residents. It is the centre of a prosperous metropolitan area with more than 100,000 inhabitants and is part of Switzerland’s largest economic area. The population has an above-average level of education and consists of over 100 nationalities, making it a rich talent pool for specialised companies and the source of Baden’s cosmopolitan flair. The city of Baden collaborates closely and actively with the surrounding municipalities. The resulting synergies make it possible to share responsibilities throughout the region and, if appropriate, consolidate them in the city centre. The city of Baden will therefore continue to play a key role in the canton of Aargau and the neighbouring regions in the future. Germany is only 25 km away. And the Swiss Alps are not only visible from Baden – they’re also just around the corner. Baden was the starting point for Switzerland’s first railway line, which was completed in 1847. Today the city continues to be well-connected by the public transport and road networks. Numerous bus lines link the city with the surrounding municipalities and depart every ten minutes. 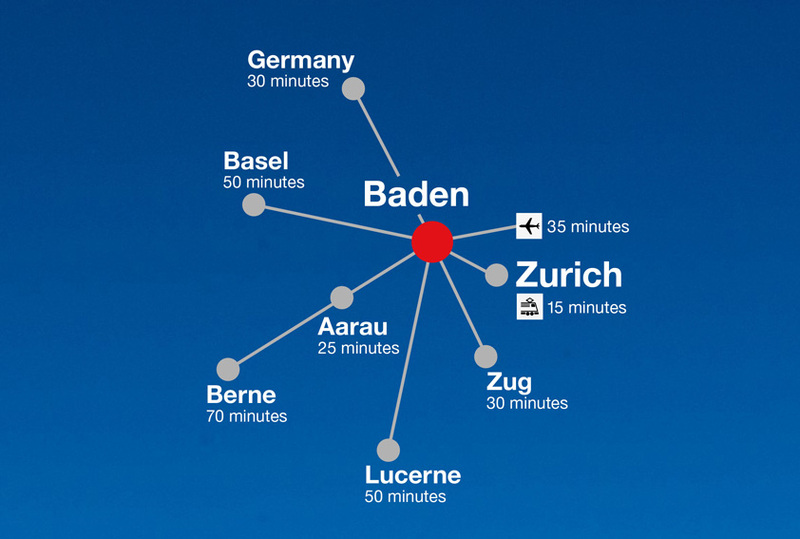 Baden is also seamlessly integrated into Zurich’s S-Bahn train network and the long-distance rail network. Direct trains to Zurich’s main train station take just 16 minutes and run twice an hour. In 25 minutes and without changing trains, you can comfortably reach the terminal building at Zurich Airport and neighbouring Basel is only 50 minutes away. The most important long-distance trains, EuroCity and CityNightLine, both stop in Baden. Direct trains connect travellers with major European cities such as Amsterdam, Berlin, Dortmund, Hamburg, Cologne, Leipzig, Paris, Salzburg and Vienna.